I'm late with this Friday's Strat because I had to travel all the way to Moscow. 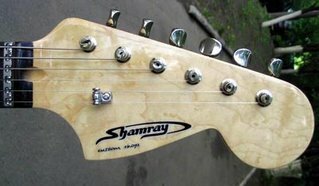 The Shamray Custom Shop in Moscow is one of my most intriguing finds yet. They do custom builds of ANYTHING. Just visit the site and browse the galleries! Another interesting item is their build documentary pages. Every custom build they do has a page documenting the project, complete with photos. Their site is extensive! From every indication, these guitars are high-end gourmet stuff too. I didn't actually play one while in Moscow, because from the time I got there till I left, it was just Vodka, Vodka, Vodka! So this morning, I wake up back home and find these links in my Wordpad. Everything else is fuzzy... but my head feels fine (good vodka!). 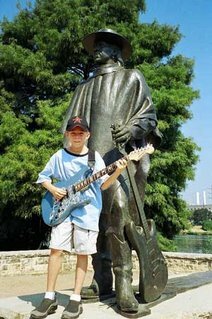 Oh yeah, the photo-- taken in Austin, Tx at the SRV statue, features the young reincarnation of SRV, holding a Shamray "S" type model. This "Golden Child" made the special pilgrimage all the way from Moscow just to touch the statue and complete the conception. He then broke into a solo, as you can observe by clicking on the image above. I understand he then promptly returned to Russia bearing one case each of Superglue and Stubb's BBQ sauce. Click the headstock image to see "The Man From La Mancha". "Creation Series - a series of exclusive guitars. These guitars will transport you to the carefree rock'n'roll of the sixties! You can experience the spirit of rock'n'roll, the spirit of freedom and the powerful sounds imaginable. Our program of research and development has refined these guitars to the pinnacle of sublime retro-futurist perfection." I'm all about that!! Let's drink a toast to the "Spirit of Freedom"-- and better pour me a double for "...the pinnacle of sublime retro-futurist perfection"! I think I'm all about that one too.